I don’t know about where you are, but here in Chester it’s been a glorious day – the sun has been shining, the birds have been singing. On coming home from work today, I noticed that my strawberry seeds have finally started to sprout (I was starting to worry I had dud seeds!) 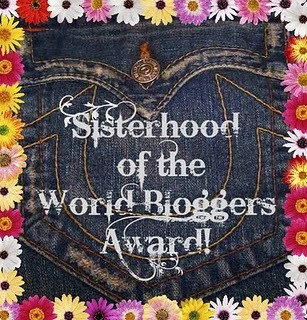 and as I sit here typing this I can hear the merry sound of a bumblebee buzzing outside the window. Spring is definitely here! I always (sadly) get a bit excited when asparagus comes into season – the price plummets and suddenly a new realm of recipes can be made. 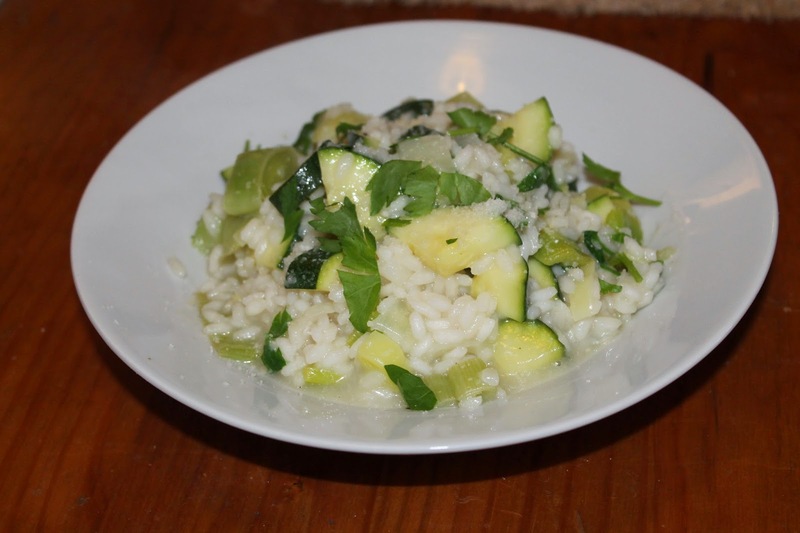 I make this particular risotto – using various combinations of veg – probably once a fortnight in spring and summer. It’s a great, tasty way of packing whichever vegetables you choose into your menu. I used asparagus, peas and spinach but you could swap in whatever you like. 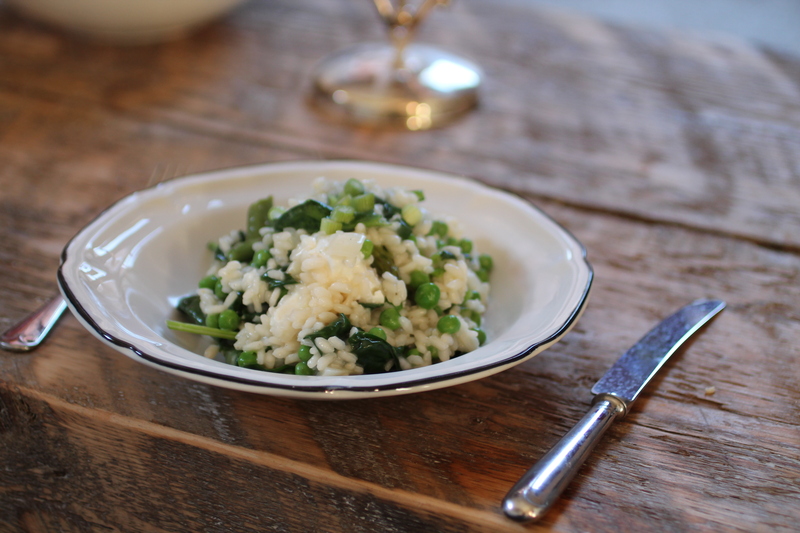 Some people might have the misconception that risotto is a heavy, winter dish. This is not true in this case. Simply swap the butter for olive oil and reduce the amount of parmesan you add, and suddenly the risotto is very light and fresh. This will serve 4 and will take around 45 minutes to make. 1. Chop the onion and add to a large casserole dish with 1 tbsp of the olive oil. Cook gently for a couple of minutes, then stir in the risotto rice. Pour in the white wine and stir. 2. When the wine has mostly been absorbed by the rice, start adding the stock bit by bit, stirring all the time. When you have added all of the stock, the rice should be just slightly al dente – taste it, if it’s too al dente, add some more stock. 3. 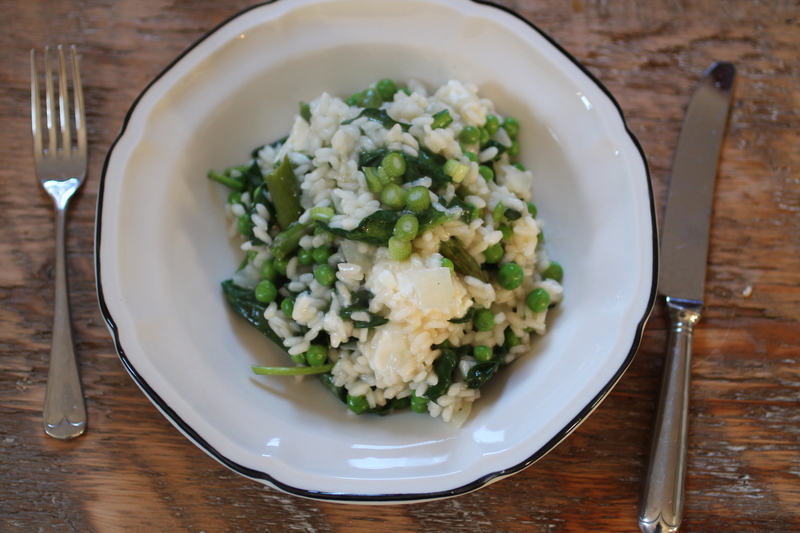 Roughly chop the asparagus, then add it along with the peas and spinach to the risotto. Stir well until the spinach has wilted, then turn off the heat. Drizzle over the remaining olive oil, sprinkle over the parmesan and put a lid on. Leave it for a couple of minutes. 4. Chop the feta into bitesize pieces, then stir into the risotto. Done! This isn’t technically a risotto at all; it’s made with lovely pearl barley (I had some left in the cupboard from my Pearl Barley, Vegetable and Bacon Broth) which makes it comforting, light and less labour intensive than a normal risotto. You already know I love the flavour combination of chorizo and pea (Chorizo and Pea Pilaf, Creamy Chorizo and Pea Gnocchi) and they work just as well as always in this tasty recipe. Mixed with parsley and just a little crumbling of feta (instead of the parmesan you’d normally have on a risotto) it’s a winner. This will take about 40 minutes to make and will serve 4. 1. Slice the chorizo and put in a large pan over a medium heat. Cook until golden and crisp, then remove from the pan. 2. Chop the onion and garlic and add to the pan. 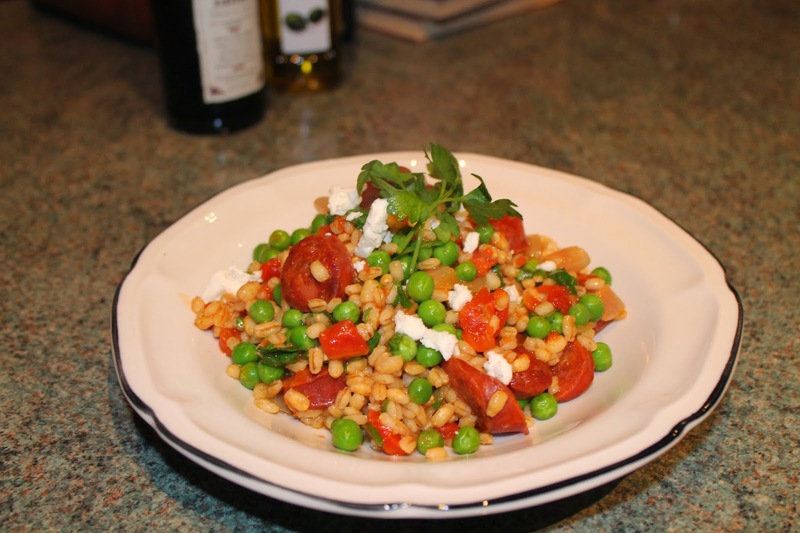 Sizzle for 30 seconds, then add the pearl barley. Stir to coat it in the chorizo oil, then tip in the chopped tomatoes and chicken stock. Bring to the boil, then turn down to a simmer for 25 minutes, until the liquid is mostly absorbed. 3. Throw in the peas, heat for another 2-3 minutes until the peas have cooked through, then season with salt and pepper. 4. Stir in the chopped parsley and the chorizo. To serve, top each bowl with a little crumbled feta. This is a classic and it’s perfect for a chilly Autumn evening. 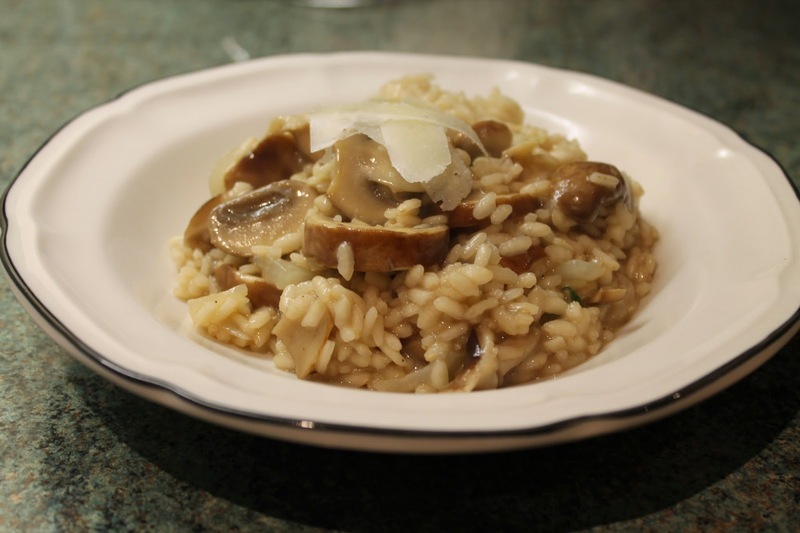 I used Madeira instead of white wine in the initial stages of the recipe (mainly because I didn’t have any white wine in the house) and it worked really well with the earthiness of the mushrooms; it turned it into a much richer dish. Give it a go if you can. You can use whatever mushrooms you can most easily get your hands on for this recipe. However, it’s tastiest if you use a variety of different types. This takes 30 minutes and will serve 4. 1. Chop the onion. Melt the butter in a large casserole dish over a medium heat, add 2 tablespoons of the olive oil and tip in the onion. Stir and sizzle for 2 minutes. 2. Roughly slice the mushrooms and add to the dish. Cook for 5 more minutes, until the mushrooms have reduced in size. Add the rice and stir well. 3. Pour in the Madeira, stir and allow to reduce down. Begin adding the stock, a little at a time, stirring until the rice has absorbed the stock before adding more. Continue until all of the stock has been used and the rice is plump and tender. 4. Stir in the thyme, then turn off the heat. Add the remaining olive oil and the parmesan to the risotto (don’t stir it) and put the lid on the dish. Leave for 5 minutes, then stir well and serve.